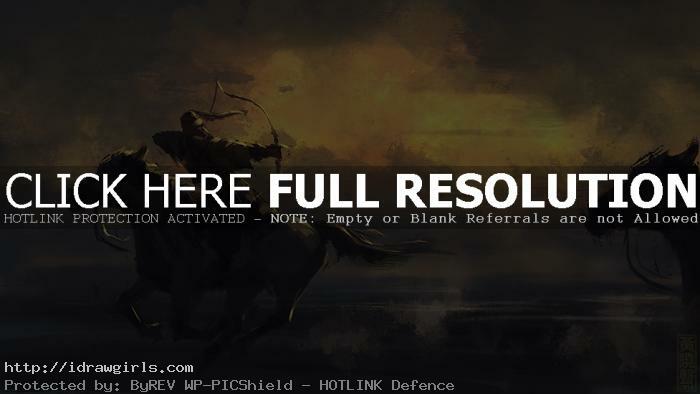 Digital painting tutorial back lighting archer on horseback speedpainting. This tutorial shows you how to paint a backlighting type of illustration or painting. Back lighting means you will see the figures or object mostly in shadow. There can possibly be rim light along the edge of the subject. It mostly come from one side and some occasion both sides of the subject. You can scroll down further to see step by step images with instruction. This is a painting of a quick concept art of a archer on a horseback. Since we are going to see a lot of open sky and cloud in this one, I pay a lot of attention to the background on how to get the cloud and the light to look right with minimum detail. Then I start painting the horse with just a silhouette of a horse. Shapes are really important in painting. If you can get the big bold shape correct, you are more than halfway done. As long as you shape contains realistic essence of the subject, it can look very realistic and dramatic lighting will help elevate your painting to another level without much effort. Then I do the same to the rider and so on. Below are step by step images tutorial.